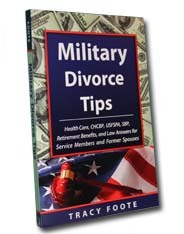 Each military divorce book provides different information on military divorce. 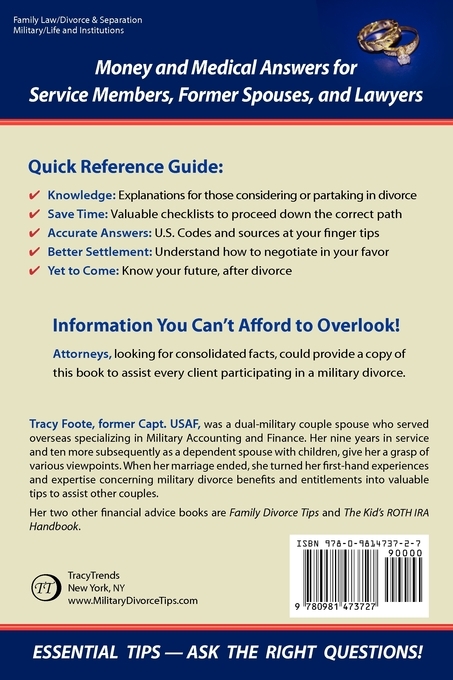 Military Divorce Tips, for the service member, the soon-to-be-former spouse, and their attorneys, provides a solid foundation for a basic understanding of military divorce issues. This efficient reference tool provides quick insight to the complexities involved without delving too heavily into the U.S. Codes themselves. At the same time, attorneys are able to use the footnotes if sources are needed for litigation. An awareness of the basics can lessen the economic and emotional turmoil of divorce. Consultations with financial advisors and divorce lawyers will be more productive, less time consuming, and less expensive after reading the topics included in this book. Divorce and the Military II reveals a great deal of information on the history of the USFSPA, the controversy surrounding it, and today’s lack of enthusiasm to enact any changes to its inequities. It does an excellent job of explaining the journey; how we have arrived at the current law enforced today. Lawyers may find the discussion on the definition of property and state comparison charts on alimony, child support and property division of use when deciding where to file.